My headscarf doubled as a pot holder today. No, not the one on my head… The one my toddler pulled out of the headscarves drawer! Did you know that head scarves are multi functional? I didn’t either – that is till I had kids. Kids find the most unique uses for the most ordinary objects. Apparently my pot holder ended up serving some more IMPORTANT use in the playroom, (where I found it later in the evening) so the head scarf that was doubling as a doll blanket served the purpose of pot holder as well. All kidding aside, headscarves and Tichels can be used for a variety of uses for adults as well. A Tichel can accessorize an outfit when tied as a neck scarf, shawl or belt. Take it along on an outing where it can serve as a makeshift table cloth. Or even around the house it can serve the purpose of temporary curtains, or an accent table runner for a party. So next time you see a head scarf in a pattern that catches your fancy, think of all the wonderful ways you can use it, and if all else fails…give it to the kids! The “butterfly” tie a great and original way to tie a headscarf. It’s light weight and very comfortable to wear. 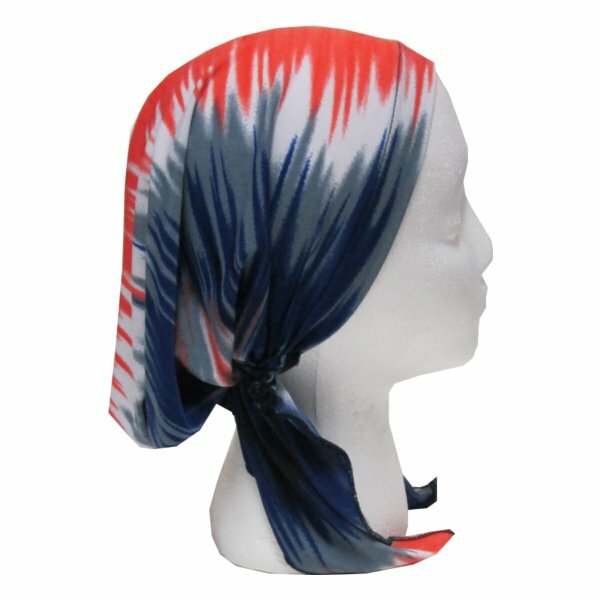 It gives a great spring or summery look and brings tying headscarves to a different level. It’s a style using two head scarves to create one custom head covering giving it a more fashionable look. 1. When tying our headscarf butterfly style we experimented using a fringed headscarf over a simple, not fringed head scarf. Our model is wearing the Israeli Tichel with Flower Design in peach as the head scarf on the bottom. Take your square headscarf and fold it into a triangle. Gently put it over your head. You should have a tail hanging on either side of your head and a tail hanging down by your neck. 2. Our model is wearing the Basic Israeli Tichel with Lurex and Fringes in white as the second head scarf. Take your square headscarf and fold it into a triangle. Gently put it over your head the same way as the first one however, place it about one inch further back than the first scarf. 3. Now, take the one inch part from the first headscarf that is sticking out and slowly and carefully fold it over the second head scarf forming a band with height. 4. Finally, take all four tails (two from each side) and tie them tightly in the back of your neck to ensure your head scarf is strong and secure.